Isaiah 42:12--Let them give glory to the Lord and proclaim His praise in the islands. Check out a short video slideshow of our time in Hawaii! Top L to R: Map of the Islands; Photo with some friends from STN; View from the plane; North Shore classic sign; Us in front of waterfall. 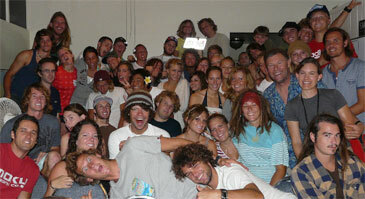 Bottom L to R: Tom and Cindy Bauer, founders of Surfing the Nations (STN) and us; STN crew and ourselves on Outreach; ministering after teaching time at STN mission base; sign for North Shore Christian Surfers fellowship near Haleiwa where Bryan spoke. We just returned from a mission trip to Hawaii, yes Hawaii. Jesus said, "Go into all the world!" and Hawaii is as much part of the world as any other place. It is not just a vacation destination but a place that desperately needs the Gospel. We ministered over there with "Surfing the Nations," and "Christian Surfers North Shore" where we preached, taught, testified, prayed, and ministered with and had many powerful and extraordinary divine appointments too. It all came about in a very interesting way for us to go over and we had a very powerful and blessed time of ministry and fellowship the whole way through. 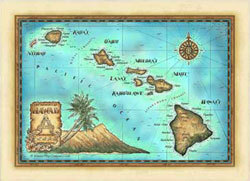 God's leading to go to Hawaii! Over the past few years our friend and renowned missionary Mel Tari, author of Like a Mighty Wind (a book about the Indonesian revival), had been encouraging us to connect and minister with Tom Bauer and his ministry "Surfing the Nations" over in Hawaii. With the seed planted in our heart from Mel and a connection made with Tom via telephone, we began to pray and wait on the Lord’s timing regarding this. While leaving the beach one day after a surf in Southern California, I walked past an unusual sight, a group of Hawaiians having a Luau and playing some Hawaiian music on the beach. As I stopped to take in the unusual event, the Holy Spirit struck me with His power and impressed upon my heart that, "Now is the time, get ready to go minister over in Hawaii." With God's guidance confirmed again in other ways after this, and with little time to prepare, we made plans to fly over in faith, trusting that God would do some powerful things. And God did even more than we expected in our venture over there. We connected with the Surfing the Nations (STN) people as well as others in a blessed way (many of the STN missionaries/students are from Sweden where we have ministered a lot in the past) and the Lord moved gloriously the whole way through, blessing and filling those there with His wonderful presence. Right: Photo of us with Crew from STN at the mission base. After an exhausting departure from Southern Calif., trying to get past two morning accidents on the freeway on the way to the airport resulting in mega backups, and then going from that straight into a 5 1/2 hour flight, landing in Honolulu, deplaning, picking up luggage, etc. etc. etc. we went straight to the mission base of Surfing the Nations. After a few greetings to some of the many Scandinavians, Swiss, South Americans, Australians and Americans training there, we then went to the evening outreach meeting where we preached and prayed and ministered in the local community center. God did amazing things straight from the get-go. At that first meeting we had three people make decisions for the Lord and we had some recommitments to Christ there too, and then during the ministry time the Holy Spirit moved as those who came forward for prayer were touched by the presence of God, especially a young man who had been struggling to forgive his father for many deep hurts. Yet, until the Holy Spirit touched his heart, as the Lord did in such a powerful way that night, he wasn't able to forgive in the way he knew he needed to. As we prayed for him, God by His Spirit empowered him to forgive. He was able to release that wound and bitterness and receive healing through the love of the Abba Heavenly Father poured out on him by the Holy Spirit. He was even slain in the Spirit when the power of God overcame him and was filled with joy afterward, hugging and embracing us, so thankful was he for the release of the burden he had been carrying! This is just an example of the way the Lord worked and moved the whole time we were there, beginning at the very first meeting after having just landed a few short hours before, and moving so wonderfully the whole time by his Spirit, something all the more significant as Surfing the Nations is not a Charismatic group per se but is open to the Spirit's work. God met that openness with the power and grace of His Spirit the whole time while we ministered there, and even increased in each meeting. We were told by a couple of the students/missionaries there, including a young Swede named Pontus, that just a few weeks ago they began to pray that the Holy Spirit would begin to move and manifest Himself amongst them. The Lord had divinely arranged our visit to take place in the timing of their just having begun to pray for the work of the Spirit to be made manifest, and the way God moved was seen as a clear answer to that prayer as the Lord was doing just that. God's timing is just incredible!!! He brought us there right in the timing of when they had just started seeking the Lord for the move of His Spirit!!! Halelujah! Fuller Theological Seminary, where I received my Masters Degree, contacted us recently about making our materials available in their campus library. Not only were we honored to have this request from them, but it has given us the little push we needed to get all our materials, both audio and video, organized and catalogued in their entirety. So check out our new catalog with all our materials available (click here). You can get yourself quite informed both theologically and historically by just going through our resources. For example, we've sought to take many historical figures and tell their stories in an interesting manner while at the same time giving spiritual insights from a Spirit-filled perspective. You can also get many of these messages now on our iTunes podcast called Grace Alone, where you can listen anytime either on line or download for later. For more information just click here. Up early the next morning, we went out to breakfast with Tom Bauer, who is the founder and leader of Surfing the Nations, for some food and fellowship, and then went straight into teaching the morning training session back at the mission base, which again was followed by a significant move of God, which led into a long time of prayer and ministry and worship where many were touched, filled, and empowered for the work of spreading the Gospel. From that we went to an afternoon outreach at Waikiki Beach, where food was given out to the many homeless and needy in the area. We met and prayed with many of those who came, and in fact, found out from them that Waikiki is something of a homeless mecca. 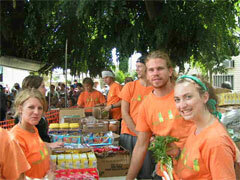 With its warm climate year-round, they told us that there is no better place to be homeless in the world. One homeless person even described how he had finally arrived at his ultimate destination of Oahu after having panhandled all the way from Chicago! This kind of activity where we were teaching and ministering, and then going on outreach took place almost every day. You may be getting the picture that we were kept quite busy, which is quite the understatement. The Lord is so good, and let us get in a few sessions in the surf now and then, something definitely not to be missed while in Hawaii, and I (Bryan) got in a few sessions even on the famous North Shore in between teaching sessions a couple of times. It actually used to be a frequent surfing destination of mine back in the day, and I never would have imagined that one day I'd find myself ministering there, which was quite the pleasant surprise from the Lord. 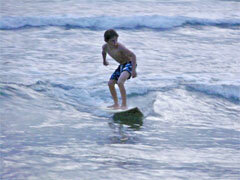 HOLY GHOST SURF STORY PUBLISHED IN NEW BOOK! Different moments during ministry time at STN as the Spirit of God fills, ministers and empowers for the work of the Kingdom. Far Right: Reconciliation initiated by the Holy Spirit. In fact, we had some great ministry right on the famed North Shore, as we ended up being the invited speakers for the "Christian Surfers North Shore Fellowship" over a weekend and had a very blessed time ministering and sharing some "Holy Ghost Surf Stories." "Talking Story" is a big part of Hawaiian culture and so some of these wild divine appointment stories we have had while traveling and surfing and ministering fit right in with the local style. On another note, it’s interesting to see how God uses some of the things that we think are so small and insignificant to do big things sometimes. Since we were going from the South Shore out to the North Shore on our own to minister at Christian Surfers and had only two extra spots in our car, we thought: "Let's pray about who we should have come with us." As we prayed, two girls who were part of STN walked by right then. It turned out that one of the girls had an issue with the other and so they had never really spent time together. And yet here they both were, stuck in a long car ride, and going with us where we were ministering, they ended up spending a considerable time together. Then, during the Christian Surfers' meeting as well as the other meetings at STN, the Spirit moved powerfully which led to a healing and a beautiful reconciliation, which was testified about at one of the last meetings we conducted. God uses everything, even our seemingly small requests about who should ride in the car with us, for good. The following week we were kept busy with a number of consecutive teaching sessions and ministry which was great as it gave us the opportunity to teach systematically and extensively by laying down a solid foundation from the Scriptures of the understanding of the New Covenant in Christ and His finished work on the Cross and Justification by Faith through Grace. It is always so important to lay that solid foundation when the opportunity is given. We expounded how this is the central focus of the New Testament and what brought about the Reformation from Luther and others and that which has renewed the Church throughout history again and again. From this we were able to segue into Paul's teaching in his epistles where he first lays down the foundation of justification by grace through faith and then goes from there to the life lived out by the Power of the Holy Spirit. It was a blessing to have so much time and freedom to teach extensively and to be able to Scripturally demonstrate that the Spirit-filled life is not some Charismatic fringe extreme (as it is so misrepresented to be today by so many) but truly the biblical focus and goal for the New Testament, born-again believer in Christ. God confirmed the teaching of His Word with power from on high as the students/missionaries there were filled and empowered, ministered to and equipped to be His witnesses out to the nations of the world that need His word and salvation so desperately. We received numerous testimonies of lives touched and changed by what the Lord wrought while we were there. At another evening community outreach college meeting we again witnessed the powerful hand of God moving. We showed some video of surfing and ministering in Europe, talked some "Holy Ghost Surf Stories" and during the prayer time witnessed again the power of God. A young man from the community who came accepted Christ into his heart and was then powerfully ministered to, and hearing the Word of God opened his heart in faith and was immediately filled with the Holy Spirit and received the gift of tongues as we prayed for him. He was one of a number of others who were powerfully touched there too. It was like witnessing the book of Acts in action. Glory to God!! Left: Mercedes and Kirsten out on South Shore after homeless outreach. 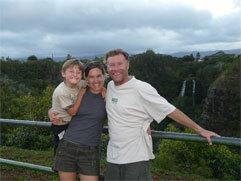 Middle: Patrick getting a few "keiki" waves. Right: Bryan grabbing a North Shore session in between teaching and ministry. We were at the South Shore doing outreach with some of the guys from STN one day. I had just prayed if there was anyone the Lord would have me speak to when a car pulled up right in front of me (Bryan). It turned out it was a guy who had done some mission work himself with YWAM in the past but was struggling and not in a good place in his walk at this point. I talked with him a bit and then asked if I could pray with him. He was reluctant to pray at first but finally relented, and ended up being ministered to and encouraged by the presence of God as we prayed. He then shared how he now began to realize that indeed God was reaching out to him in the middle of this time in spite of his own weakness, resistance and struggle. He was encouraged and had a very changed countenance when I left him. On another day, we were driving through Haliewa on the North Shore looking for some inexpensive food but having no luck whatsoever. After a few cruises up and down the main street we found a place grilling Huli Huli chicken right next to a little church. Sensing the Holy Spirit's lead and feeling we had found the answer to our hunger, we went over. I began to talk to the guy grilling the birds and it turns out he was a fellow believer. 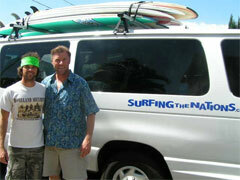 Moreover he knew a fellow surfboard shaper from California we had recently had a divine appointment with. As we ate our Huli chicken, I sensed I was to give him a word of encouragement before we left. I told him that what he was doing was very important to the Kingdom of God, not knowing myself what that might be. As the smoke filled his eyes from the grilled chicken he was cooking, he began to share how he had felt led to help out the little church we were next to with fundraising through these chicken sales. He originally didn’t really want to be cooking chickens, but as the little church was on the brink of being forced out of their building by one of the worst land baron corporations in Hawaii, he felt compelled to help. And, as a result of the fund raising he was doing, the little church went from almost going under, to now being able to pay for their building and being totally solvent and secure financially. The word I gave him reminded him that though he was doing some hard labor cooking these chickens all day, it was totally important work for this little church and had changed their situation completely, and that his labor had brought a great breakthrough for the little church. It is strange how when you obey the Holy Spirit’s leading and give a word to someone, not only are they encouraged but you also get blessed just to by giving the word. Praise God!!! And to top it off, after getting back to California we had another divine appointment with his friend the surfboard shaper and prayed for him, and he was powerfully ministered to and encouraged in his walk as well! He said: "I was feeling so down today and here you just happen to cruise by on your bikes when I'm walking by and pray for me and what a shot from above it is that you brought and that I truly needed!!!" Before leaving the Islands we also went over to Kauai to visit my uncle who has cancer and we spent some considerable time speaking with, explaining, and answering many questions and sharing the Gospel with him. Continuing to keep him in your prayers would be appreciated. An amazing divine appointment happened while visiting Hanalei Bay on Kauai one day. We ran into a girl at a burger stand who we began to share Christ with. She had been witnessed to already by a guy who worked there and understood some things about the Gospel. We pointed out to her, however, the need to be born again and then asked if we could pray with her, which she agreed to enthusiastically. So we prayed with her to yield her life to Christ. Hallelujah!! That was amazing enough in itself but then we discovered even more amazing things connected with this. We then found out that the guy who had been sharing with her while working at the burger place was getting ready to leave that very day to Oahu to attend Surfing the Nations! 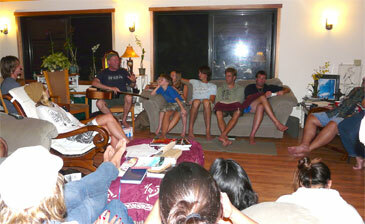 “We just came from teaching and ministering at Surfing the Nations,” we told her excitedly. We all felt, all of a sudden, like we were in the twilight zone. We all remarked how radical it was that we should “just happen” to run into and share and pray with her when her friend who had been ministering to her was going to, that very day no less, the same exact place we had just come from and been ministering at. It shows that God is never short of miracles and some just blow your mind! God sent us to minister to her and follow up on the seedplanting her friend was doing, and see her come into the Kingdom. One plants and another harvests!! We gave her some materials and info and left just amazed at the wild ways in which God can sometimes work. We were so blessed the whole time we were ministering in Hawaii and found that we ourselves were encouraged and stoked by the openness to the Spirit and the warmth of the Aloha welcome that we received by all those we encountered there, including all the crew at Surfing the Nations with Tom Bauer and his family, and those at the Christian Surfers North Shore like Auntie Glo, Richard, and Charity as well as all the others we met on these remarkable islands. Left: Robert & Bryan and STN van with boards ready to go. 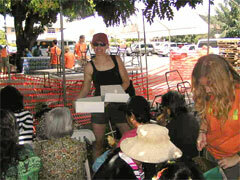 Middle: Mercedes passing out food at homeless outreach. Right: STN members line up to give out food to the needy. The Lord has been moving powerfully upon our return. We conducted a revival right upon our landing in California in the city of Orange and God moved very powerfully. We had about 12 people make decisions for the Lord and a good number of people who testified they had been filled with the Spirit and received the gift of tongues too. A woman who just happened to venture into the meeting having felt led by the Spirit to come in not knowing what it was all about was powerfully ministered to and encouraged and recharged with power for her ministry on the street spreading the Gospel. We also ministered at Set Free on Easter week. 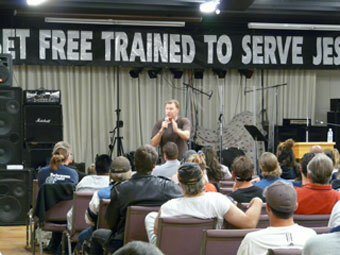 Set Free reaches out to a lot of homeless, bikers, addicts, and gangsters. We ministered at their new facility next to the motel they use as a rehab and housing center. We had 9 people come forward to receive the Lord as we closed the service where we preached at, praise God! The pastor told me that all those who came forward were there for the first time, and thus it was exactly God’s timing that we were there that night to be the ones to invite them into the Kingdom. We also had a very powerful ministry time with the Holy Spirit, witnessing powerful manifestations, including a lengthy time of praise and adoration of the Savior amongst those we were praying with and also a great outpouring of joy and laughter for a girl who was carrying a heavy load of grief as well as for her friends who were helping to pray. We had a healthy dose of the Holy Ghost and His joy. Even though Set Free is backed by the Southern Baptist convention they are always open to our ministry because they know it is biblically based and that the anointing breaks through all barriers and brings people into the Kingdom and sets captives free. Hallelujah. 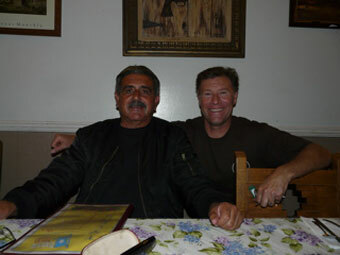 We were all amazed by God’s supernatural timing: that we should come into a restaurant where the cook should have “just happened” to be in a meeting where she “just happened” to hear the very same story we were sharing that same night from the same person (John Ruttkay) we were just sharing about. We were all amazed and felt like we were in God’s twilight zone for a bit again. That someone should come out of the kitchen and then ask us who we were, and then to find out that we were the people she just happened to hear about at a ministry meeting, was just incredible. We prayed with her and were ourselves amazed at the Lord’s mighty hand and perfect timing.